RenWomen. Review by Julia Pascal. by Dale Griffiths Stamos & W Scott Griffiths. In our society multi-tasking is often seen as a women’s skill but rather than it being a critique of Jill of All Trades, the thesis behind the book is to honour the fresh concept of Renaissance Women. The authors are twins, brother and sister, Scott and Dale Griffiths. Dale is a playwright, screenwriter, poet, linguist, musician and academic. Jack also has multiple skills but the focus of this text is the celebration of polymath women from antiquity to today. RenWomen features among the famous Hypatia, (360-415 BCE), Hildegard von Bingen (1098-1179), Eleanor Roosevelt (1884-1962) and, of course Elizabeth I (1583-1603), as well as the stars and icons of the last century. Most impressive, however, is its revelation of largely unknown women who have overcome enormous hardships in their struggle for autonomy and independence. Rather than list the many brilliant lives that are revealed here I will focus on that of Hungarian Jew, Eva Haller. Her family had rejected Judaism for Catholicism and therefore had no idea that the Nazis would target them for annihilation. However, conversion offered no escape from the Nuremberg Laws. As a child, Haller escaped arrest and took a ten year old boy with her on her flight. Her survival in the final days of the war, and during the Soviet liberation, reveals extraordinary courage. The story continues in a grim postwar epilogue where Haller ends up in Ecuador, survives a rotten marriage, pregnancy and a near-suicide. It is only when she has the chance of gaining an education that the narrative takes her towards her fate as a Renaissance Woman and massive success. This is a recurring theme in the lives of the women represented here. They were destined to be victims but education offers the opportunity for intellectual rigour and an entry in to society. Haller reminds me of other children whose education was arrested by the war and whose lives were fractured by little or no schooling. As Haller says, ‘It was as if …after all those years of drifting from one horror to another, I needed to validate myself’. What all these Renaissance Women have in common is not only educational and academic skills but the vital qualities of tenacity and chutzpah. Survival is not enough. Among Haller’s many skills is her innovative work with children on the autism spectrum and her political activism promoting Afro-American Civil Rights. Haller is acclaimed as a major mentor and philanthropist. Her awards are many and her achievement is massive. She cheated Hitler’s so-called Final Solution and still defies his theories of ‘race’ by helping others on the margins. As a result of the authors’ research, we can see patterning of mentoring between survivor women. Haller was helped by the famous sexologist Dr Ruth Westheimer, a German-born Jew whose father was murdered by the Nazis. 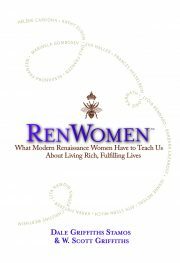 I have chosen only one contemporary woman to highlight but Renwomen celebrates the many whose names are not well known. This inspiring study is a way of acknowledging those who came from tragedy and, instead of being demolished by their intended fate as victims, have fought back to give back huge contributions to others living on the edge.